LOCATION, location! 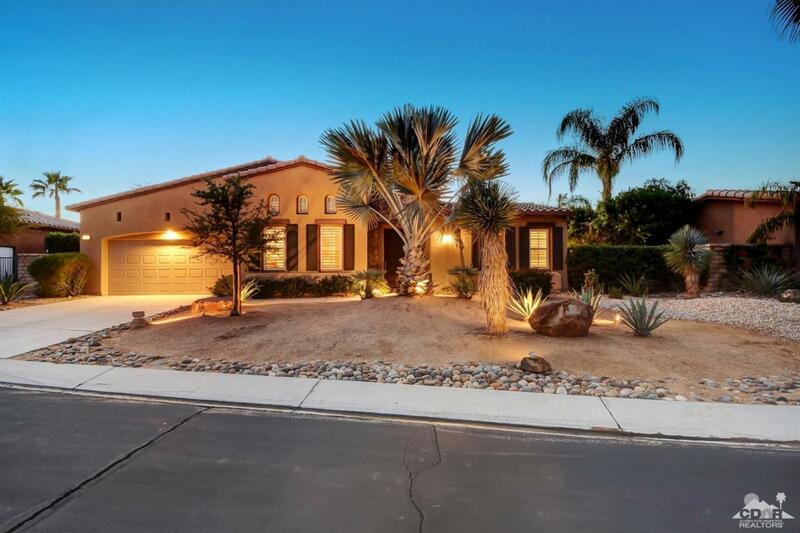 Elegantly upgraded, gorgeous home located in one of the highly sought after communities of Rancho Mirage. 2,300+ sq.ft. of spacious living space, & $60,000+ in upgrades; this 3 Bedroom home is a must see. From top-of-the line Plantation Shutters, Groehe Faucets to Monica Tile & Marble flooring, almost everything is upgraded. The Gourmet Kitchen with its center island, Granite Countertops, custom-style Maple cabinets, upgraded appliances & cabinets with pull-out shelves is perfect for the Chef in your family. Kick off your shoes after a busy day & relax in the Great Room with Fireplace & built-in TV Cabinet. Step into the backyard with its breathtaking landscaping, Gorgeous View & custom pavers. Location of this home provides privacy, seclusion from your neighbors behind you & away from the noisy street. HOA dues include Social Membership (Pool, Tennis, Fitness Ctr & more) to prestigious Mission Hills C.C. next door. Please call for a private showing. Listing provided courtesy of Joyce Witten of Personalized Properties.